Fired up the K1 tonight, tuned to 40m because I was hearing NOTHING again on 20m. First station I worked was David W4SRE way down in Macon Georgia on 7053 Khz. David is a SKCC member, number 15102T, and we had not worked each other before. David gave me an RST of 329, and I sent him a 559. It was a wee bit noisy and some QSB in there but otherwise a good contact. David was originally licensed in South Africa in the 1980's and he came to the USA in 1997. He learned CW in the South African navy in the 1970's! Thanks for the QSO David! So I tuned some more and all I was hearing were Georgia stations, which was a nice welcome change from only hearing North Carolina stations! Next up was Randy KK4BNC and he was running K2 at 90 Watts into an end fed sloper up about 50 feet, from down in Cataula, Georgia. I had to look that one up. He is located in the western part of Georgia, almost on the Alabama state line. What was funny, was when I put his call sign in my N3FJP Logger, I saw he and I had worked each other exactly one year ago yesterday...now that's pretty neat. I checked Wikipedia to learn more about this town and I found that in January of 2017, Cataula was hit by several tornadoes. They have done a good job of rebuilding since then. The tornado outbreak of 2011 almost wiped them out though...and I thought we got hit with a lot of severe weather here in central Indiana. Wow! My QSO with Randy went on for almost a half an hour, we discussed keys, radios, the weather, and traded SKCC numbers. Randy is SKCC 8054, we said our 73's and bid each other a good day. Easy armchiar copy, Randy has a great fist. Work him if you hear him. That's it for now...not much really but I thought it was funny how the K1 was locked on Georgia tonight. Early today Dave Benson K1SWL, the designer of the Hilltopper radios being sold by 4 States QRP Group, posted an email to the group listing the following mods to improve audio performance of the rig. Not that it really needed much. Some ops have found the sidetone to be a bit loud, other ops have found it to be just right. If you find the sidetone to be louder than you would like it to be you can do the following mod. Change out R8 (22K) with a 47K to 100K resistor. I have not done this mod, as I find the sidetone to be just the way I like it. However I wonder if you could put in a little 100K pot instead and adjust it to your favorite sidetone level. Not sure a small pot would fit in there, but may be worth a look. The values of R5 (150K) and C22 (470 pF) may be changed to 330K and 220 pF respectively. This yields a gain increase of 6 dB without affecting that stage's rolloff characteristic. 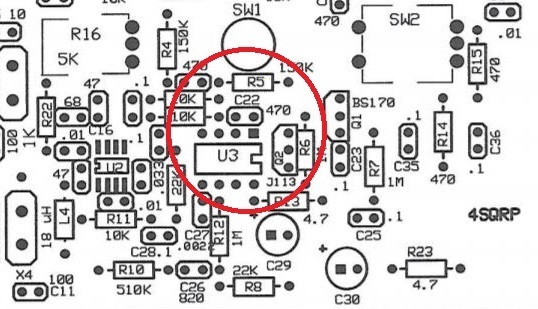 These two components are in 'tight quarters'- between U3 and the pushbutton switch. Cutting one or both component leads and tacking the new components on the underside of the board makes the change much easier. NOTE: I cut the components off just above the board, and used solder wick and a solder sucker to clear out the solder so I could use needle nose pliers to tug out the "stems" while heating the backside of the board. Worked well but I had to take my time. Straight from Dave, "As some of you have noted, there's a 'screech' on loud CW signals- it necessitates riding the gain control. I evaluated samples of a more robust op-amp- the NJM4556AD." Replacing the NE5532P with that new device eliminates the screech. You'll hear some distortion when limiting occurs, but it's much less objectionable than the NE5532's rude noises. Its 'limiting' threshold is also about 6 dB higher than the present device. The net result of this change, combined with above mod, is 6 dB more audio without the rudities (that's a word!). 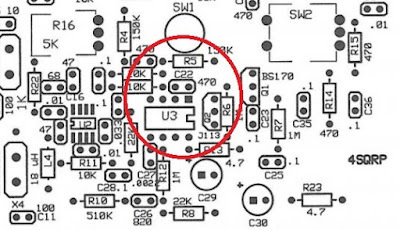 I have an OpAmp on the way, it appears to be a pin for pin swap out. The OpAmp in the Hilltopper rigs is socketed, so this swap out should take but a few minutes to perform. I've always said you meet the most interesting folks on ham radio and tonight was no exception. I was tuning around on 20m looking for any kind of signal, it was too late and the band was too quiet, and I still wanted to have a QSO. So I tuned down to the 40m band to see what was going on there and stumbled across KF4IZE calling CQ on 7114. Will lives down in Fayetteville NC and has been an Extra class operator since 1998. He gave me a 569 and I had him a solid 599 here in Central Indiana. He enjoys fixing up and running boat anchor gear, as well as riding his prized 2002 Harley Davidson Fat Boy. Will was using a old Navy Flameproof key tonight, and I was at the K2 and using my Nye Viking Master Key. He gave me his SKCC number and I forgot to give him mine...I swear I am losing my marbles. Thanks for the QSO Will and thanks for your service. My dad is a retired Sgt. Major and my son is a Marine. We owe you guys a lot! 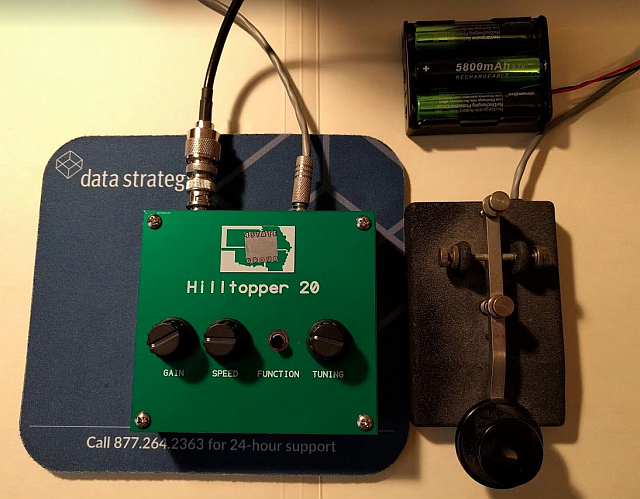 When I got my Hilltpper 20, it was pre-built by an experienced QRP builder and QRP operator, so I was satisfied with it bveing built correctly. I ran it through the calibration process per the documents and was very satisfied with the results of that calibration. I had some trouble getting it exactly right so I was asking about the process on the 4 States QRP Group reflector. Dave Benson K1SWL, the designer of the Hilltopper rigs and former owner of Small Wonder Labs was kind enough to send me explicit instructions on the calibration process, and using those instructions I was able to get the transmit and the receive spot on. So since I had Dave's attention, I sent him an email asking if there were any tweaks I could make to the receiver that would make it a bit louder and not sound so muffled or narrow. He responded that he'd been thinking about that and suggested I change R5 to 470K or 510K and change C22 to 150pf . He had calculated this might add nearly a 10db gain to the circuit. Once I got the parts it took me maybe an hour total to remove the old parts and install the new parts. My de-soldering skills are horrid so I went slow so I didn't gronk up the circuit board. Solder wick is your best friend here, and having a de-soldering bulb handy is really really helpful. I don't have any gear that I can use to measure the actual electrical improvement but my ears were VERY happy to hear an increase in audio gain, and an increase in the number of signals. I would tune a station on my K2 and then switch to the HT20 and was able to tune the same, even the weak ones. Dave did mention that this mod MIGHT cause some screeching if I tuned any really loud signals, so far I have not experienced that. I reported the improvements to Dave and he is now working on a possible Op Amp replacement idea. I can't wait to see how that turns out. Stay tuned. If you perform this modification, please let Dave Benson know how it turned out for you and if you see any improvement. I was very happy with it. Yesterday here in the Hoosier Heartland we had gorgeous sunny skies, fair winds, but cold temps. So I did not get to take the rig to the outdoors. Woke up this morning with a serious head cold and about an inch of new snow....good grief. Will Old Man Winter just pack up and GO. 20m Finally Opens a Wee Bit While I am Home! If you have been reading along, you'll remember I bought a pre-built Hilltopper 20 QRP transceiver about two weeks ago. I have not had a single QSO on it until today, and I am a happy man. I have been trying and trying to make a QSO with this radio every afternoon when I get home from work, but it's just been too late in the day for a cooperative 20m band and my sorry, sorry antenna, the infamous attic dipole. Finally this afternoon I was able to work a quick contact with HH2AA from a remote operated station down in Haiti. HH2AA is the callsign for the Radio Club of Haiti and they were working a contest. The operator for this station is controlling it from a remote site. This is a special call to support the Haïti Air Ambulance Service. Please consider donating to this wonderful cause! According to QRZ: The HH2AA station currently sits at 6300'ASL with a Elecraft K3 running 100w with 3 Element Tri-bander fixed to the U.S. and a 4 Element Tri-bander fixed to EU along with a OCF Dipole off a 80' Tower. I worked them at 19:40Z and on 14043.2 Khz today, we traded 599, but this was a contest exchange...they were 100% 599 here in Indianapolis today. I see they have now moved up to 15m. What a view from the tower eh? Thanks for the contact HH2AA, QSL card is in the mail! I am now ready to take this show on the road as soon as the weather gets a little warmer around here. I have an Alex Loop antenna, and a portable vertical called the PAC-12 I hope to use during my lunch hours and from the local park bench. I have a Hilltopper 20, a Norcal 20, and my K1 to go portable with this summer. Stay tuned and listen for KB9BVN....he's desperate. Best DX and 73 to all! In the world of QRP today, we were informed of the passing of Rev. George Dobbs G3RJV early this morning. George was a QRPers QRPer and was a huge believer in "minimalist radio". 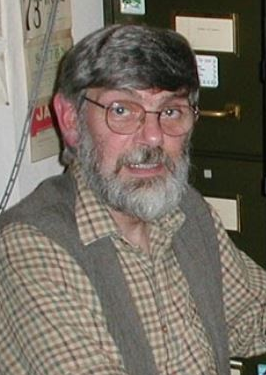 George was the founder of the G-QRP (QRP club of Great Britain) and was the editor of Sprat Magazine for years and years. The world famous "Sudden Receiver" was designed and built by George in 1989 and is still sold as a kit by QRPme today. George taught us about "Occum's Razor" and the word "pelf". A featured speaker at numerous FDIM events in the past, a contributing author/editor to Sprat, and many RSGB publications. He will be greatly missed. Tonight when I got home from work I was treated to an extra hour of daylight thanks to this invention we call Daylight Savings Time. I was hoping that the 20m band would give me a QSO on my new radio, the 4 States Group Hilltopper 20. It was not to be. Here's my setup, a Hilltopper 20, a set of 18650 batteries, and a Nye Viking Master Key. I have re-calibrated the tuning so I am right on frequency now, thanks to Dave Benson K1SWL for the calibration assistance. I gave out some free CQ's for about 30 minutes and then checked with the Reverse Beacon Network to see if I was even making a dent in the ionosphere. My Hilltopper 20 can output a solid 5 watts into my attic dipole. I was not encouraged by what I saw. Being heard in Arizona, Alberta, and Utah...but measly signal strength getting there. It's obvious I need to get on the air at a different time of day. I have been trying in the morning as well between 09:00Z and 09:40Z and not hearing anything. My friend Ivin W9ILF was able to make a couple nice contacts on Sunday with his 1.5 watt Cub on 20m. He QSO'd with a station in Washington state and Idaho. I was not on the air Sunday at all...bad move eh? My Hilltopper isn't acting quite right. I tune to 14060 and it transmits on 14062. I am also having some issues with the receive being on the wrong frequency as well. So I have signed up for the support group on groups.io and will get this figured out. 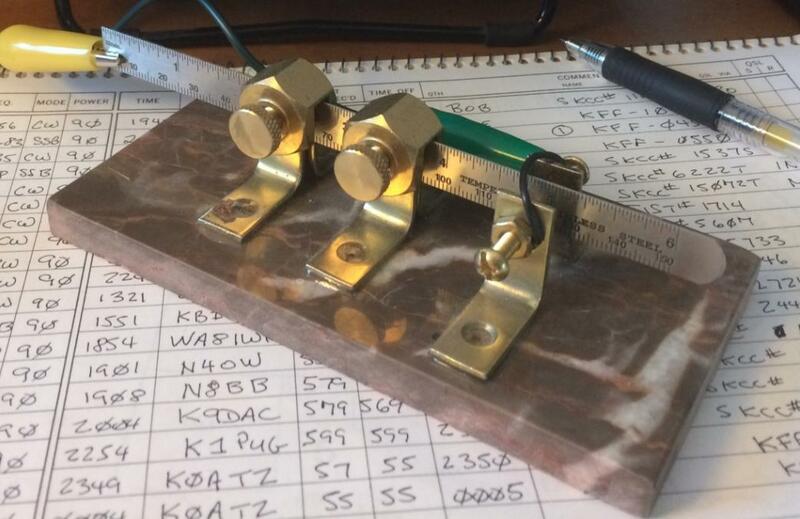 20m has been dead as a door nail all weekend...at least in the CW band. I think everyone must be running the ARRL SSB contest this weekend. The Hilltopper can put out about 7 watts with a fully charged 12v battery. I can't wait to have a QSO with it. I was able to get on the air for a bit this afternoon, and knocked out four contacts, but no new states. I had to go down to 7052 and call for SKCC, I managed to work GA, NC, NJ, and MD with the K1 at 5 watts. The A index is at 12 and we're seeing no sunspots right now so it's pretty tough sledding. I am going to try hard to get the Hilltopper 20 going in the right direction and between it and my Norcal 20 I hope to make contacts in the western states I need for my WAS efforts. Anyway, thanks for checking in. Next weekend we are doing a VE test session for 40 people that are finishing up a county CERT training class. That will be fun! Ever have one of those days? I was getting ready to work some CW and after getting my desk top all arranged the way I wanted it, I somehow managed to shove my 1964 vintage Vibrokeyer off the back of my desk. It was not plugged into the radio, as I have been working with just my straight key lately. It landed....on the paddle. The worst possible way it could have landed. Feast your eyes on this sad sad picture. The paddle busted free of the adjustment nuts AND the little red ruby thingie on the top is GONE. It's a totally sad day in Mudville kids. Luckily, Vibroplex has the parts to fix it up. Looks like about $35 with shipping. 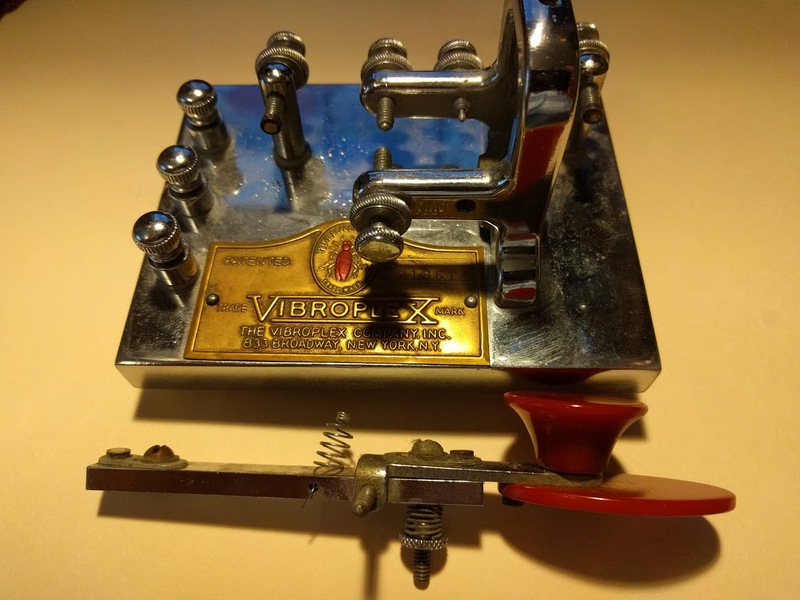 I will attempt to fix it myself since I am a Radio Amateur, and if I gronk it up too badly I will ship it off with a box of money to the mothership at Vibroplex for repair, adjusting, and cleaning. Once I found all the parts I could find under my desk, I calmed down and tuned to 20m in hopes of working a western state. I CQ'd on 14050 for about 20 mins...and didn't get a bite. John K3WWP has been having great success on 80m, but alas I do not have an antenna at home that will work on 80m. I need to improve the antenna situation here. So I tuned down to 40m, 7051.5 Khz, and sent out my call a few times and nothing. I was reading the latest Harbor Freight Ad-zazine when I heard KA4UPI call CQ. I answered him and we had a great QSO. Mark was running 100w into a Double Bazooka antenna up about 40 feet. His radio was the venerable Icom 746 and he was SKCC member 2582T, a NEW SKCC contact for he and I both. Mark lives in Dublin Georgia. Dublin has about 17,000 people in it, and was named for Dublin Ireland by the early settlers that came there from the Emerald Isle. They also have produced a number of NFL players along the line. Thanks for the QSO! I still need 20 more states! If you have never been to a QRP convention and you are an avid QRPer, then you owe it yourself to get to one or two of them this year. Coming up in April is one of the most popular conventions we have in the United States. Ozarkcon 2019 runs the weekend of April 5-6 in Branson, Missouti. It is held at the Stone Castle Inn and Conference Center. This QRP convention and banquet is hosted and sponsored by the Four States QRP Group. You can get all the details on their website. Four Days in May is probably the oldest QRP convention and banquet we have, this year it is again in Fairfield Ohio, at the Fairfield Holiday Inn. It runs from Thursday May 16th to Sunday May 19th. Which just so happens to be the same weekend as the Dayton Hamvention. The FDIM hotel is conveniently close to the Hamvention site in Xenia Ohio, so you can knock out two birds with one stone. FDIM is operated by the QRP Amateur Radio Club International and features an all day symposium on Thursday, a Vendor Night, a Club Night, a Buildathon, and a fine banquet. If you have never been to FDIM, you owe it yourself to make it one year. These are the two coming up the fastest. In addition to these we also have Lobstercon, usually held in July up in Maine. Pacificon will be held in San Ramon California the weekend of October 18-20 in 2019. This is a big show, if you are in the that part of the nation, you won't to miss this. I most likely will not be on the air tonight, but instead I will be watching the 1982 John Carpenter classic "The Thing". We have a fantastic theater nearby called the Artcraft. It was originally opened in the 1920's and the Franklin Heritage group has been slowly but surely remodeling it and putting it back to its former glorious condition. patron that drove the furthest to get there. All the popcorn is locally grown! It's like being a kid again and stepping back in to the glory days of Hollywood! 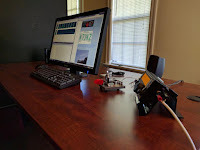 This weekend we have the South Carolina State QSO Party on Saturday, and the North Carolina State QSO Party on Sunday. Both offer QRP categories so get out there and work those states. Have fun and I'll be back on the air tomorrow. Working hard on the WAS I started in 2018. I was worried that I would not get to get on the air tonight, my wife, my sister in law, and I went out to dinner at Culvers and didn't get home until 8PM...which just happens to be my bedtime. (I get up at 4:30AM for work). Once again I fired up the K2 and tuned her right to 7120 Khz. I fired off a couple QRLs and no one seemed to mind...wasn't hearing anything either, so I sent out a 3x3 CQ and was immediately answered by Randy N5IXA out in Oklahoma City. Wow, Oklahoma two nights in a row! Randy is SKCC 5896 and he was running 100 Watts from his Alinco DX SR8 into a Loop antenna. I gave him a genuine 599 from Indiana and he sent me a genuine 339 from Oklahoma. I'm thrilled he heard me at 10 watts on the attic dipole. Randy has been a ham since he was 15 years old, and is a retired ER Nurse according to his bio page on QRZ. Randy is also active in the local community theater, which must come naturally to a HAM. Right? Check him out on QRZ. You meet some of the most interesting folks on the CW bands. I am pretty sure the 40m band was on vacation tonight. The noise was high, the QSB lasted a long long time between waves coming back in. I sat and listened for about 90 minutes tonight before I finally completed my CW QSO. Once again I started on 15m...heard nothing, so I headed to fertile QSO grounds on 40. Except there was not much there but some SSB in some language I don't know right on 7120 Khz. So I tried 7115, then to 7050, and finally landed on 7030 Khz and tossed out a few CQs only to be ignored. So I was playing around with my laptop when I heard a faint KB9BVN DE K7JKZ coming from the K2 speaker. Oh boy...I almost never hear 7 land on 40m here in this QTH so I cranked it up to 10 watts and fired my call back. John K7JKZ must have super sonic ears because he heard me...barely. I sent him a 339 and got back a 349 from the great state of Oklahoma. 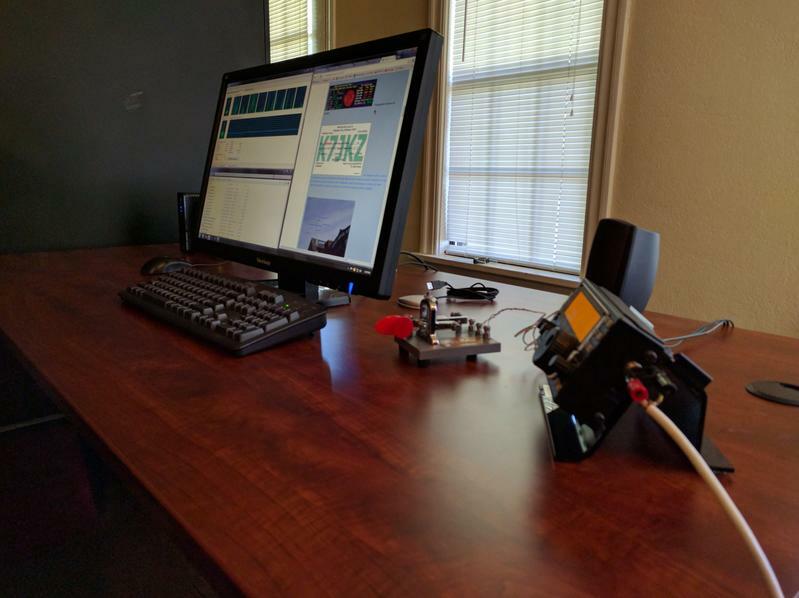 John runs ONLY a KX3 in his shack and from the looks of his QRZ page he has a fine shack indeed. I'd like to thank John for his service to our great nation, he served as a US Navy Radioman 2nd Class and was a submariner on the USS Andrew Jackson and the USS Ulysses S. Grant. 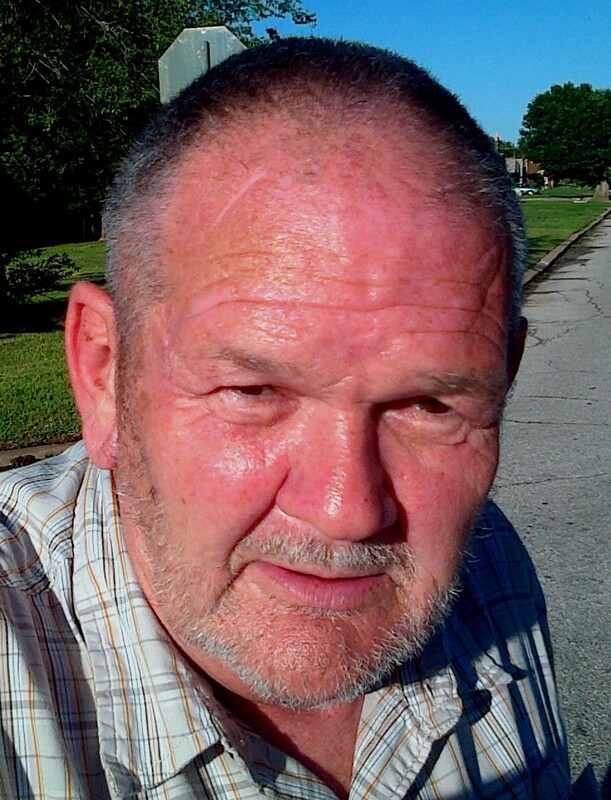 John calls Oklahoma City his home now, although he was originally licensed at age 13 in Medford Oregon. We had to send our RST, QTH, and name a couple times before we copied it on both ends. The QSO was just about that short, we bid each other 73 and the band went dead again. I am very glad I hung around, Oklahoma isn't real plentiful around here, so it's great to have that one in the log. So far 2019 my WAS efforts have only yielded 10 states. I heard New Mexico tonight, W5UX, but the QSB took him away as fast as it brought him in. It was brutal this evening and I was using every filter in my box of magic radio tricks. Keep on CQing! Well the weather man says we have a big nasty late winter storm coming sometime tonight, ice, sleet, snow and then maybe a little rain forecast for the early hours tomorrow. I can not wait for summer to get here. Good thing we have plenty of edibles and lots of movies to watch. Fired up the K2 tonight and tuned around on 15m, didn't hear a peep. So I moved on back down to the best band in the land, and parked on 7120 Khz. I threw out a few slow CQs and a few faster CQs from the straight key and got no takers. Just about the time I was ready to shut it down and go watch the snow fall, I heard a loud but somewhat slow CQ from KB5KGO. I threw out my call and he came back to me on the first try. Warren KB5KGO is an honest to goodness Novice license holder. Folks there are not many Novice licensees left out there, but Warren is one for sure. From his QRZ page I learn that he is about 68 years old, and lives on the northeast shore of Lake Pontchartrain way down there in Slidell Louisiana. Warren gave me and my 10 watts a 589 and I sent him a legit 599, he was running an Icom 718 to an end fed wire at 100 watts. He was making the trip like gangbusters, and the slight bit of QSB we had did not phase his signal one bit. Warren is probably the first real live Novice operator I have worked in a long time. We QSO'd at a blazing 7 or 8 words a minute. Armchair copy to say the least. If you get a chance to work KB5KGO, jump on it. Great fist, and great QSO. Since we went over 30 minutes, I printed him up a Rag Chewer award and mailed it off with my QSL card. Thanks for the great QSO and good old timey radio night here at home. I hope to work Warren again! So after dinner tonight I got in front of the K2 and tuned around the upper part of 40m, the old Novice/Technician part, specifically around 7120. I was surprised to hear a QSO going on so I moved down the band a few Khz and heard W2RAN calling CQ on 7116. So I pumped the K2 up to 10 watts and sent my call sign out to him from the attic dipole. Ran W2RAN came right back and we had a nice QSO, and exchanged our SKCC numbers. Ran is Randy Wright and he lives up in New Hampshire. I don't get to work that part of New England very often so I was happy to give and GET a 599. I checked Ran out on QRZ and he is an avid CW operator, preferring straight keys and side swipers, or cooties. Check out this homebrew Cootie Key. Randy lives in Lyndeborough NH, and this little town has quite a history. Named after judge Benjamin Lynde, while serving as a proprietor of Lyndeborough, Judge Lynde lived in Massachusetts, where he presided in Suffolk County over the trial stemming from the Boston Massacre. The town has been home to the Lafayette Artillery Company (founded 1804) since 1833. The town office building, Citizens' Hall (opened 1889), is listed on the National Register of Historic Places, as is the Lyndeborough Center Historic District, which consists of the Congregational Church (circa 1836), Town Hall (1846), and remnants of the Town Pound (1774). Randy also likes to work WWFF, KFF, and POTA stations whenever he can. Thanks for QSO Randy! What can I say, I have been neglecting my blog, and I have not been on the air nearly as much as I would like to be. I have a million excuses and they won't all fit here, so I will say, I'll try harder in March. Not much going on this weekend, I am on call for work so that means I need to hang around the QTH and get some chores marked off the list. I have that all done and got some time this afternoon to get on the air. I forgot this was the ARRL DX contest weekend. So I fired up the K2 and tuned to my favorite 40m fishing hole, 7120 and heard nothing but the soothing sounds of slow rolling QSB. I fired off a CQ or two using my trusty and unrusty Nye Viking Master Key and was answered almost instantly by Alan W4AMV down near Raleigh NC. I was on the attic dipole today and I am certain that my house is aimed directly at North Carolina. I have more NC stations logged that any other state. Today I was running 10 watts, and I feel no shame. Alan W4AMV is an avid homebrewer, if you want to see some really cool stuff, look him up on QRZ. Today he was running 50 watts into I think a random wire to his tree tops. I had him 599 and he gave me a 579. QSB was rolling slow and wouldn't you know it, just as the QSO got going I started getting QRM from a couple other stations that just sort of showed up out of nowhere. We carried on though for about 15 minutes. The band conditions were fair, and I will try for a few more QSOs today. I am going to try and see if I can find any DX up on 15m, the attic dipole works well on 15 and 40 for me so maybe I'l have some luck. Don't forget, Daylight Savings Time returns to the US in a few weeks. It'll be time to SPRING FORWARD those clocks and deprive yourself of at least one hour of sleep. I wish we'd just pick a time standard and stick to it all year around. An Old Friend Returns + A Heads-Up For CLE243! MiscDotGeek talks Radio Homebrew on W5KUB! Copyright 2017 - Brian Murrey. Simple theme. Powered by Blogger.